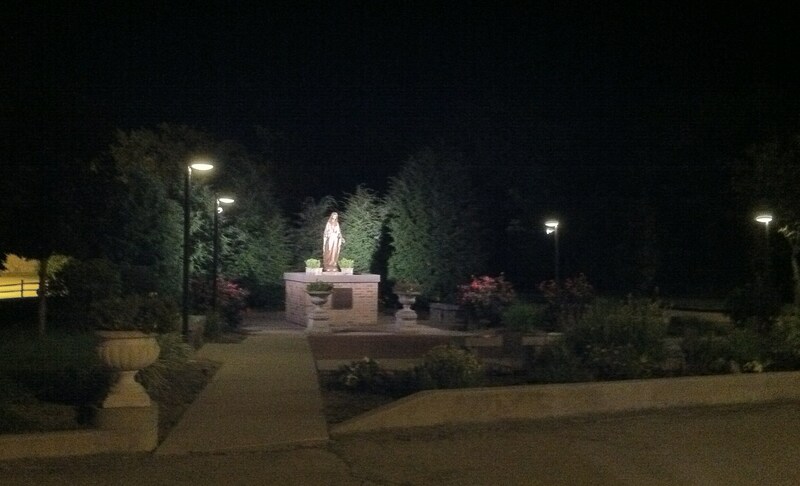 A Mary Garden is a garden dedicated to Mary, the Mother of God. In a Mary Garden, which can be as small as a clay pot or as large as a city block, a statue of Mary is surrounded by herbs and flowers which have special significance for her, through legends or naming. Since medieval times, flowers have taken their names from the virtues of Mary, or events in her life. There are literally hundreds of flowers (both annuals and perennials), herbs, bushes, shrubs and trees that reference Mary. 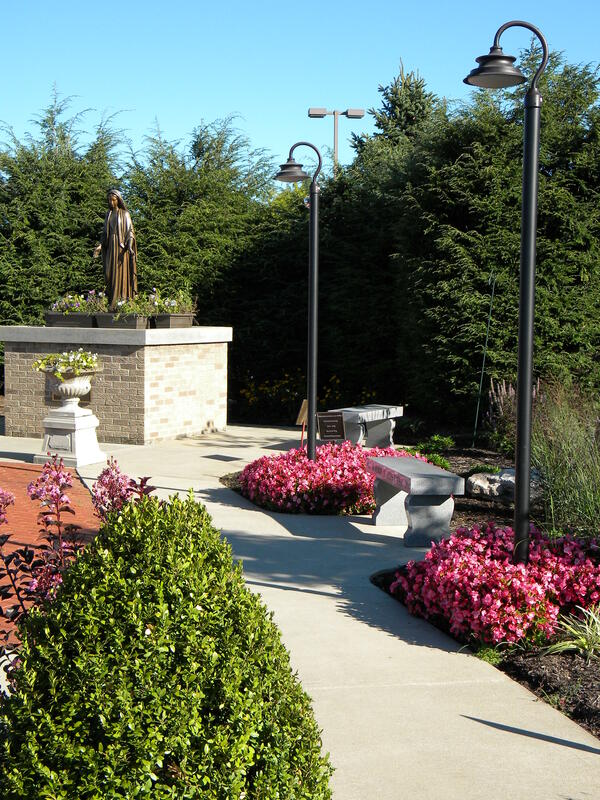 Mary’s Garden at Saint Elizabeth Ann Seton Parish was officially dedicated on May 19, 2002. The Christian Mothers and Ladies Guild began the planning for the project in the fall of 1999. Two of our members, Joanna Graham and Lori Smith, came upon the idea of a Mary’s Garden after attending a horticultural class. The new offices, looking for a project for the church and also in a way to honor Mary, decided to pursue the idea of a Mary’s Garden. After several very successful fundraisers, the groundbreaking was done in 2001. Many volunteer workers (ranging in age from 2 yrs to mature) have helped in the planning, digging, planting, and mulching of our Mary’s Garden in time for the dedicated in May of 2002. 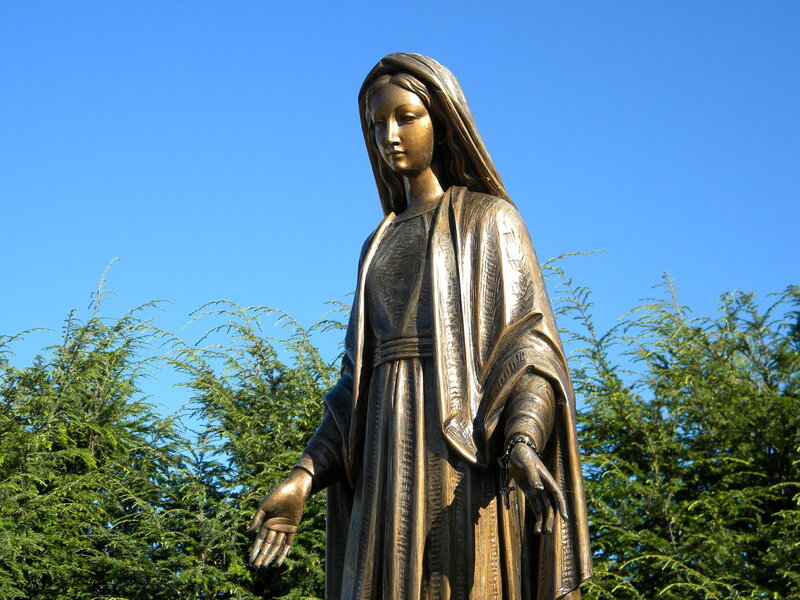 Our statue, “Our Lady of Grace”, was special ordered from Italy in fall 2000. She is 5 ft tall, bronze, and arrived here in North Huntingdon in spring 2001. A special pedestal for our statue is located in the center of our garden. Inscribed bricks form the center court of the garden. Name plaques are located throughout the garden in memory of loved ones. Seven marble benches are also positioned throughout the garden on the cement walkways to sit upon and meditate or just enjoy the view and a nice peaceful setting. 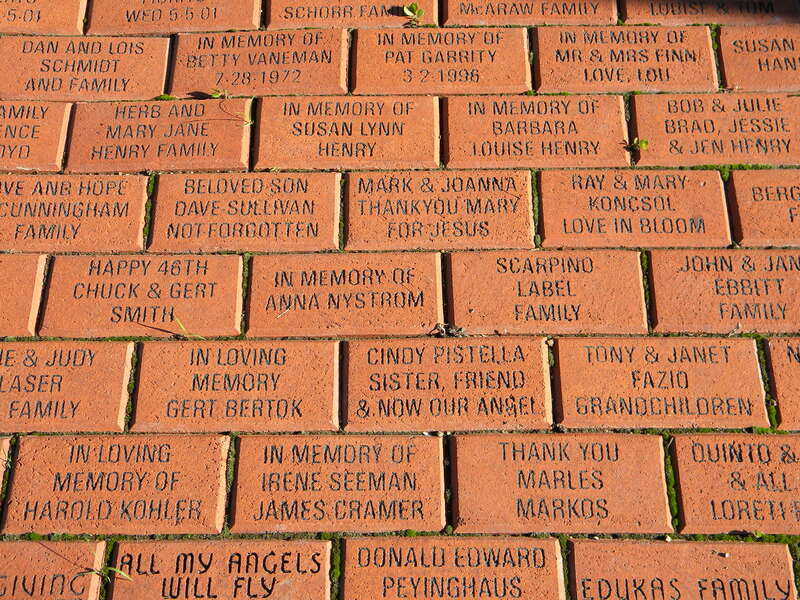 Forms are available for anyone wishing to order a brick for the garden. What better way to remember both Mary and a loved one. 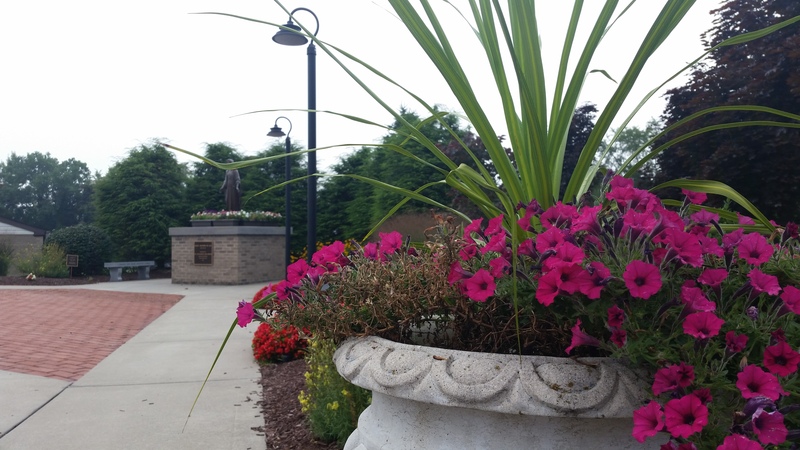 Take a moment… We hope you enjoy a visit to our Mary’s Garden. Take a moment and sit down on one of the benches, look around at all the beautiful flowers, take a few deep breaths and just relax. Close your eyes and picture Mary in her home in Nazareth. Picture her eyes (forget-me-nots), her hair (maidenhair fern), her five fingers (Potentilla). Think about her apparel: her smock (morning glory), her veil (baby’s breath), her nightcap (Canterbury bells), her gloves (foxglove), and her shoes (columbine). Remember her attributes: Mary’s humility (violet), the fruitful Virgin (strawberry), Mary’s queenship (Virgin lily), Mary’s flower of God (English daisy), Mary’s glory (Saint-John’s wort), and Our Lady’s faith (veronica). Think about her life: the Bethlehem star (bellflower), the Christmas flower (poinsettia), Lady’s bedstraw (dianthus) – Mary used bedstraw to prepare a bed for Jesus, the Epiphany flower (chrysanthemum), the flight into Egypt (fig tree-legend says that the Holy Family ate the fruit of this tree during their flight into Egypt), Our Lady’s Tears (Lily of the Valley – tiny white nodding bell-shaped flowers can be likened to a train of tears), Our Lady’s Tresses (Asparagus fern – legend holds that at the foot of the cross, Mary, in deep agony, tore out a tress of her hair which Saint John preserved), Mary’s bitter sorrow (dandelion), and the Assumption (hosta-plantation lily blooms at the time of the Feast of the Assumption). Hello. I live in New Zealand and I’m currently writing an article on Mary Gardens for a national Catholic magazine. I wonder if I can quote from your website from ‘Picture her eyes…” To the final words” Feast of the Assumption”? It says so much about Our Lady & these beautiful flowers. Incidentally, I recently had an article published here on St Elizabeth Seton though I must confess I knew nothing then of the lovely garden at your parish! Pity I live so far away, it looks delightful.